There's a heap of fossilized trilobites. I'd like to be under the sea in a submersible vehicle, seeing if an octopus' garden contains any living fossil trilobites. Wouldn't that be great? Well, the coelacanth was considered extinct, but it was found doing mighty fine. Maybe trilobites exist way down there and don't want to be seen, did you ever think about that? Although fossilized, scientists have been able to determine the composition and function of their eyes. They had multiple lenses in each eye, so they had excellent vision under the sea. In fact, they could see things in three dimensions, sometimes double 3-D. Other kinds of trilobites had eyes on stalks, so they could do 3-D 360. To believe that such amazing specified eye complexity is the product of blind (heh!) chance processes in evolution, well, ya gotta wanna believe that. 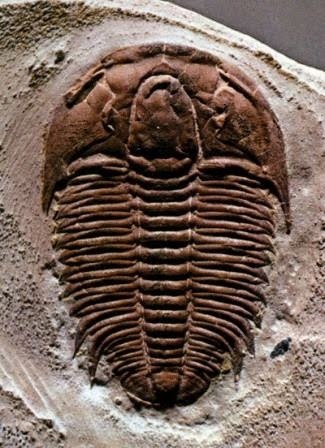 It makes far more sense to admit that the evidence supports special creation, especially when trilobites take a bite out of evolutionary theory. What do physicists and paleontologists have in common? One analyzes equations while the other digs fossils. But when it came to discovering God’s complex design for trilobite eyes, expertise from both fields was required. As a child in Italy, Riccardo Levi-Setti started collecting fossilized trilobites, an extinct group of sea creatures somewhat similar to horseshoe crabs. This interest led to curiosity about rocks, then to crystals in rocks, then to the chemistry of crystals, and finally to the physics behind chemistry! Though he eventually earned his doctorate in physics, his love for trilobites never died. That’s why a physicist showed up at a talk about trilobite eyes, given one fateful day in the early 1970s by renowned paleontologist Euan Clarkson. To lay eyes on the rest, click "Trilobite Eyes — Ultimate Optics".